The Winners of the 2012 Eurpoean e-Inclusion Awards have been announced this afternoon (June 22nd) at the European Commission’s Digital Agenda Assembly Conference in Brussels. The awards competition has been running since February and was aimed at rewarding those championing the way forward in digital inclusion and exploiting the potential of technology in dealing with today’s challenges. I was honoured to be asked to take part in the judging of the awards in May after the closing date for entries. In all nearly 300 entries were received – whittled down into shortlists for the final judging. The quality of the entries was very high and the judging was difficult as it was hard to choose between the many benefits being offered by the shortlisted entries. 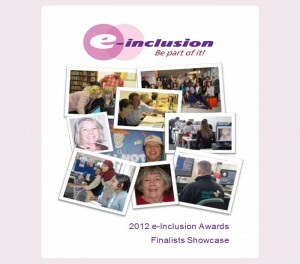 You can read full details about the e-Inclusion Awards on the e-Inclusion Awards website. The page detailing the e-Inclusion Award winners is here.